In this month of darkening daylight we bring to you a luminous collection of new amber jewelry designs tightly focused not just on the inherent natural beauty of amber, but equally focused on amber shaped into forms that reflect oceans, meadows, forests & the creatures- both flora & fauna who inhabit them. Happily, the inventive sterlings silver forms have received just as much attention & nuance. 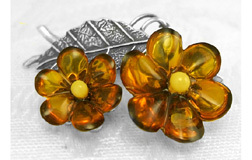 Some of these designs have a distinct vintage feel, like our Marguerite line, composed of exquisite cognac blossoms with antique colored amber bead centers, each one carved from a single piece of amber by hand, then backed in sleek sterling silver. Seahorses, fish, leaf motifs, flowers, seashells and our long awaited–& well worth the wait– amber angels. The Natural World Collection was created by prizewinning amber artists Jadwiga and Bohdan Holub of Gdansk, Poland. 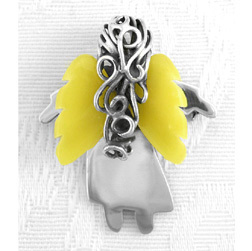 Just exactly how, you may wonder, do angels fit into the natural world- even amber ones? Aren’t they considered to be supernatural beings? Andzia considers them to be very much a part of the natural world–just because you can’t see them doesn’t mean they aren’t here with us. Our radiant, shy amber angel is a bit mysterious-her face remains known only to you. 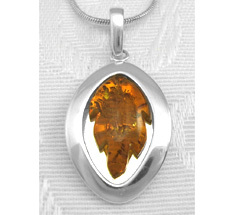 This family of artists has an intrinsic love of amber & it shows in everything they touch. We totally agree with their artistic philosophy, centered on using the richest materials in the fashion of the old masters- selecting first the amber, then the design- & we are proud to present this heirloom quality collection. We first met at Amberif a few years ago; they are quite well known for their work, specializing in exotic, oversized amber insects of all kinds, particularly dragonflies- having many pieces in museums & private collections around the world. 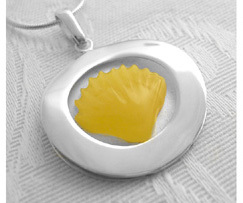 My personal choice are the Amber Seashells- not just a classic design, but a very classical one. Simple, clean lines- in person, these are simply stunning. The ancient motif of the seashell has been with us since before even Aphrodite herself rose from the sea cupped inside one & like amber, shells were once traded as currency & were one of the first materials used for human adornment. There are incredibly luminous, each handcarved in elegant mat & butterscotch tones- is a tiny piece of art you can wear everyday. 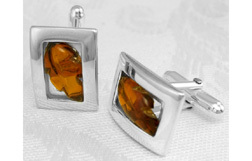 The Natural World Collection reaches into the forests as well, in a series of distinctive, elegant men’s amber cufflinks & tie tacs as well as pendants & bracelets using petite carved amber leafs tucked inside sterling silver frames, open along the edges.